This post contains affiliate ads / links. See disclosure policy. It has been an absolutely crazy and exciting summer this year. Amidst a move from east coast down to the south, buying a home, and trying to settle down, we squeezed in a mini vacation to give ourselves a much deserved break. That is why my blogging routine came to crawling halt. I missed blogging very much and I am so glad to be back! Life overwhelmed me and I just couldn’t keep pace. We went to Niagara falls – I was finally able to keep my word before moving down south – Sarah had been asking me to plan a trip to Niagara for so long. I am so glad we made it happen. When you visit Niagara Falls, the best thing to do is to visit the falls and see it from both the US and the Canadian side. First thing is Niagara falls is spectacular and beautiful. My suggestion would be for you to see the falls from both sides come to your own conclusion on which view you like better. My personal opinion – the view from the Canadian side is beautiful and I like it a little better than the view from the US side. When travelling with kids, proximity is king. We stayed on the US side at Holiday Inn, Niagara Falls (part of Intercontinental Hotels Group) that is about a 5-7 minutes walk from the Niagara Falls State Park, NY. We were able to walk to Niagara Falls State Park several times a day given the proximity. 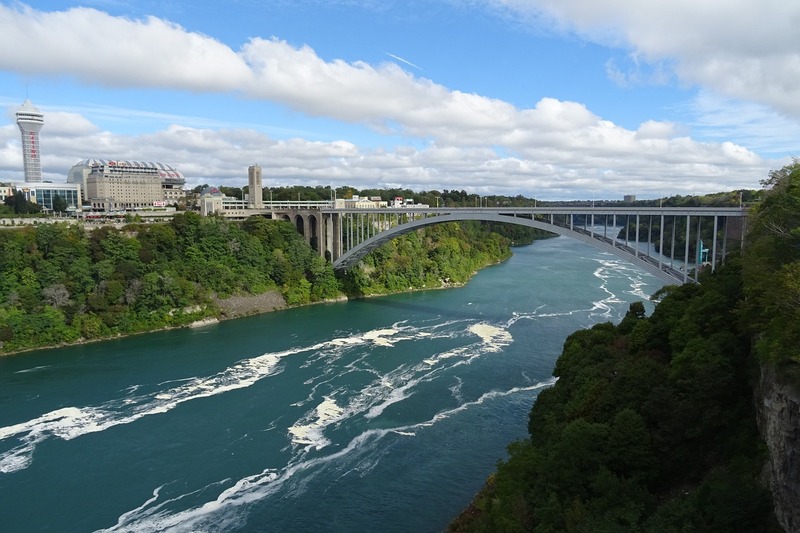 In addition, the Rainbow Bridge (between US and Canada) that is above the Niagara river, is about 10 minutes by walk from the Holiday Inn we stayed at. You could drive or walk across this bridge. There are a lot of things to see and do. 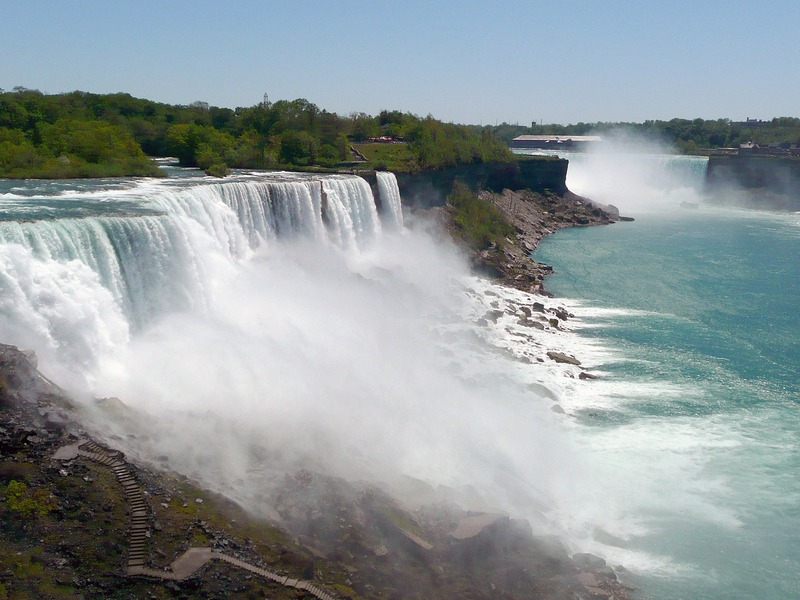 If you are staying on the US side, the easiest thing to do would be to get a Discovery Pass at the Niagara Falls State Park, NY which covers several attractions and you also get to ride the trolley for free that takes you to each of the attractions. A boat ride that takes you close to the water falls – fantastic views and be prepared to get wet. You go down an elevator and walk on a trail and get as close to the water falls as possible. There are different spots where you could experience the water literally hitting you, especially when you stand on the Hurricane Deck. The rainbow bridge is about 400 meters long and connects US and Canada. Niagara River flows under this bridge. As I mentioned earlier, you could drive or walk across the bridge. To my understanding, the bridge is meant for non-commercial use. I have never walked across the border from one country to another – so I found this very exciting. So, we chose to walk. As you walk across the bridge, you can see the water falls and it is just a cool thing to walk from USA to Canada or vice versa. Important thing to note is that you need to have your passport and all the required travel documentation. Please check border crossing rules. We are US citizens, so we took our passports with us. Immigration line was very short given we were pedestrians crossing the border. It took us less than 20 minutes to walk from our hotel into Canada. We spent some time sight seeing, enjoying the Canadian view of the water falls, went to a Starbucks nearby, enjoyed a cup of coffee and started walking back to the US. Once again, the immigration line was short we were able to come back into the US fairly quickly. One thing to keep in mind is that you will have to pay 50 cents per person when you enter back into the US – make sure you have coins. Have you been to Niagara Falls? Have you walked across the Rainbow Bridge? What was the best part of your trip? Do you have any interesting travel suggestions / tips for Niagara Falls?